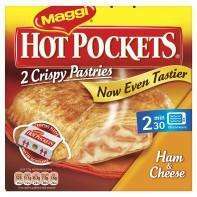 Just been in Asda and all the Hotpockets are reduced to £1 which is half the normal price. I think they only have the 2 kinds now which are Bollagnaise or Ham & Chesse. Shame though cos I think the egg and bacon ones were nicer. Anyway, instore and online so should be nationwide. Not everyone cup of tea but I like them as the odd quick snack so am sure some will appreciate the deal.. but please dont vote cold just because you dont like them.